[ssba] Smartphones and tablets have changed the approach toward design and user experience. Before the proliferation of mobile devices with advanced web-browsing capability, web designers had only one primary challenge to deal with – keeping the same look and feel of their websites in various desktop computer browsers. However, interacting with websites on smartphones and tablets is not the same as doing that on a desktop computer monitor. Factors such as Click versus Touch, Screen-Size, Pixel-Resolution, support for Adobe’s Flash technology, optimized markup and many more have become crucial while creating websites with Responsive Design. 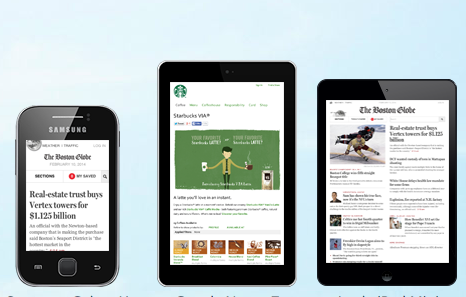 But, why is responsive design so important for your website? First, we must understand what is “Responsive Web Design”. Responsive Web Design (RWD) is an approach of laying-out and coding a website so that the website provides an optimal viewing experience — ease of reading and navigation with a minimum of resizing, panning, and scrolling — across a wide range of devices (from laptops and iPads to mobile phones). The designer creating a Responsive Design should ensure that the website’s navigation elements, screen-layouts, text, images, audio/video players and other UI elements re-adjust themselves on a variety of devices. Then, one needn't spend extra time and money creating and maintaining one “mobile-site version” and another “desktop-site version” of his/her website. The notion that making a responsive website is expensive is just that, a notion. The fact is, while the cost to make a responsive website is somewhat more than making a conventional website, the expenses to duplicate a website for mobile and other devices is eliminated. Result? A significant reduction in total development costs. In addition to that, a responsive design cuts the total ownership cost, by means of taking away the effort to maintain different versions of a website i.e. a “desktop-version”, a “mobile-version”. In the long term, investing in a responsive website design is the smartest decision. Responsive Websites are agnostic to devices and their operating systems. A responsive web design ensures that users get the best and consistent experience of a website on any device of the user’s choice and preference – be that the iPhone, iPad, a smartphone running the Android OS, or Windows OS and others. Rather than compartmentalizing website content into disparate, device-specific experiences, it's smarter to adopt the responsive web design approach. That’s not to say there isn’t a business case for separate sites geared toward specific devices; for example, if the user-goals for your mobile content-offering are more limited in scope than its desktop equivalent, then serving different content to each might be the best approach. But that kind of design-thinking does not have to be our default. Now more than ever, digital content is meant to be viewed on a variety of different devices. Responsive web design offers the way forward.